GALION — After two straight games with walk-off hits provided by Braxton Giavedoni, the Galion Graders were not in need of heroics on Thursday night, defeating the Licking County Settlers by a lopsided 13-3 margin. With the victory, Galion has won three straight to improve their overall season record to 9-7 as the Settlers drop to 7-9. The Graders had a 3-0 lead heading into the bottom of the fourth inning on Thursday and that is when the rains came. Parke Phillips had delivered a single and took second on a passed ball. During Zach Mottice’s at-bat, the slight trickle of rain drops became a downpour. 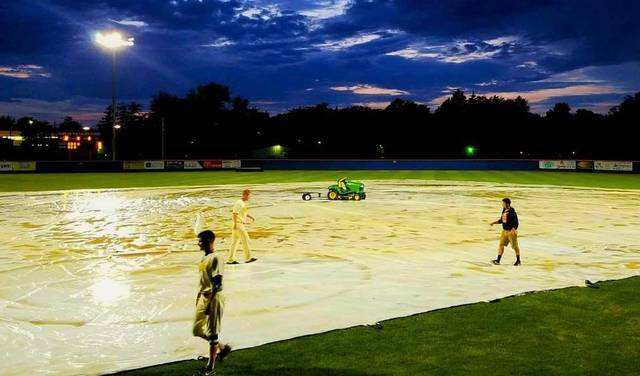 All hope was not lost on the squads though as Galion rolled out their new tarp to cover the field in hopes of resuming play. The teams did just that after about an hour and half delay and some necessary field maintenance, the game was back underway to a thin crowd. Start time of the game was marked 7:08 pm with the conclusion coming at 11:55 pm. Galion tacked on another run in that rain-delayed inning to take a 4-0 lead. Licking County managed to break up the shutout the Graders were plotting in the top of the sixth, scoring once to make the score 4-1. The Settlers would not score again until the final inning, placing a two-spot on the scoreboard off relief pitcher Dustin Baird. Offensively, the Graders kept the bats going, earning back that run in the bottom of the sixth. The seventh inning saw an offensively explosion of five runs to put the game well out of reach. Three more runs were tacked on to the 10 already scored in the bottom of the eighth to more than secure a Graders home victory. “New Guy” Richard Krieger was the starter atop the mound for Galion on the night. Krieger threw the four innings before the delay, allowing just two hits while walking one and striking out four Settlers’ batters. Post-delay, the Graders called on Christian Specht. Specht would work the fourth through eighth innings, scattering three hits, giving up one earned run and fanning two en route to earning the win. Baird tossed the ninth, allowed two hits, two earned runs and struck out one. Phillips and Josh Kent both finished the contest with multi-hit games for Galion. Phillips knocked two singles to accompany three runs scored and a stolen base. Kent had a single, a double, a run scored and a run driven in. Brandt Nowaskie blasted a double for Galion’s other extra-base hit on the night to go along with a stolen base, a run scored and 3 RBI. Brady Hettinger drove in four runs, scored three runs and finished with a single. Matthew Freeman finished with 2 RBI and a single and fellow infielder Joe Crank also notched a single with a run scored and an RBI. Mottice and Sam Stewart had one single and a run scored apiece with Mottice also swiping a base. Grant Fuller and Matt Noel rounded out the offensive boom for the Graders on the night. Fuller belted a single and scored twice and Noel recorded a run batted in. Galion scored their 13 runs on 11 hits, committed no errors in the field while stranding 13 runners on base. Licking County plated three on seven hits, finished with three errors and left six runners on the base path. The Graders will be on the road to Newark on Friday to play the Settlers again before returning home for a weekend clash against the Lima Locos.